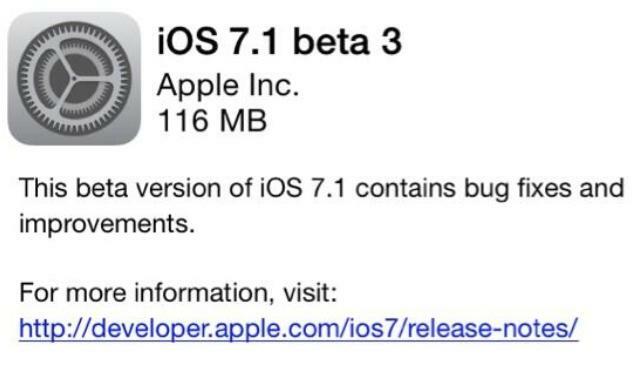 Apple on Tuesday supplied developers with its third pre-release beta of iOS 7.1, a forthcoming update for its mobile operating system, with the latest build bringing fixes for creating a new iCloud account, as well as playing back audio books. People familiar with the software indicated it is identified as "Build 11D5127c." It is available to download from Apple's developer website, as well as over the air on test devices, but is not intended for general public use. The third beta of iOS 7.1 is said to fix an issue that could arrise when creating a new iCloud account during setup. In addition, the latest build reportedly no longer gives an error when users enable iCloud Keychain. In addition, Apple also fixed an issue in iOS 7.1 that could cause problems when listening to audiobooks on an iPhone, iPad or iPod touch. The software is not yet ready for primetime, however, as people familiar with the latest build said that Apple has informed developers that a handful of known issues remain. For example, 32-bit Bluetooth applications on 64-bit devices, like the iPhone 5s or latest iPads, do not work properly. An error is also said to remain in which the Messages application sometimes indicates an iMessage send failure immediately after sending. Developers can work around this by tapping the error icon to re-send the message. Previously, Apple provided developers with the second beta of iOS 7.1 in mid-December, addressing bugs related to iTunes Match, and also making it easier to access Touch ID settings on the iPhone 5s.